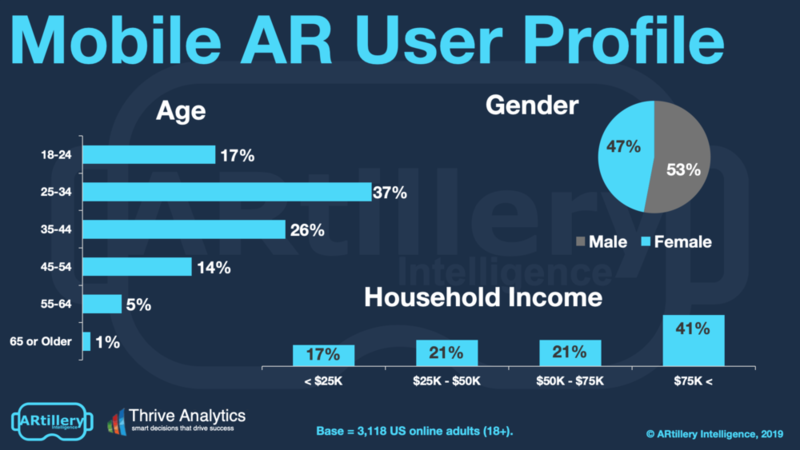 ARtillery Intelligence’s latest report, AR Usage & Consumer Attitudes examines original consumer AR survey data. Subscribe for the full report. VRARA members get a discount. How do consumers feel about mobile AR? Who’s using it? How often? And what do they want to see next? More importantly, what are non-users’ reasons for disinterest? And how can app developers and anyone else building mobile AR apps optimize product strategies accordingly? These are the questions we set out to answer. Working closely with Thrive Analytics, ARtillery Intelligence wrote questions to be presented to more than 3000 U.S. adults in Thrive’s established survey engine. The results are in and analyzed in the latest ARtillery Intelligence report. This follows the last few months’ ARtillery Intelligence Briefings, which examined social and commerce-based AR. Now, a deeper view into real consumer usage and attitudes validates those narratives while providing new dimension on mobile AR strategies and opportunity spotting. As for the findings, mobile AR usage is up to 22 percent of the U.S. population. These users are mostly experiencing mobile AR through apps, such as those built on ARkit and ARCore. But we see trending towards lower-friction experiences such as “AR-as-a-feature” and web AR. These formats have advantages of less friction. Web AR can have easier session launches and compatibility given that it takes place in the mobile browser. AR as a feature meanwhile takes place within already-popular apps. Pokemon Go and Social Lenses are examples of the latter. Users also appear active and engaged across the board, with more than half reporting they use mobile AR at least weekly. The top app category is gaming, which we attribute to Pokémon Go’s popularity. But other key categories, such as Social AR and visual search, are on the rise. That includes commerce-related AR like product visualization. And utilities like visual search could represent AR’s first truly mainstream killer app and “all-day” use case. We’re at the stage in AR’s lifespan when utilities will start to emerge to challenge gaming & social use cases. Mobile AR users also indicated high levels of satisfaction with the experience. But beyond these and a few other positive signals, there are some negative signs. For example, non-mobile AR users report low likelihood of adopting soon, and an explicit lack of interest. Put another way, AR’s highly visual and immersive format is a double-edged sword. It can create strong affinities and high engagement levels. But the visceral nature of its experience can’t be communicated to prospective users with traditional marketing such as ad copy or even video. The same challenge was uncovered in our corresponding VR report last July (we’ll publish the second wave in Q3). This makes it a common challenge with immersive media like AR and VR. It will take time and acclimation before they reach a more meaningful share of the consumer public. Meanwhile, there are strategies to accelerate that process and to build AR apps that align with consumers’ current standards. We go deep on those strategies in the latest report. Subscribe for the full report. VRARA members get a discount. Michael Boland is Chief Analyst and VP of Content for BIA/Kelsey, covering online and mobile media. Mike is a frequent speaker at top industry conferences such as BIA/Kelsey events, Search Engine Strategies, ad:tech, and WHERE 2.0. He has authored in-depth reports on the changing local media landscape including online video, social networking and mobile. He contributes regularly to highly read online news sources such as Business Insider and the Huffington Post. A trusted source for reporters covering the interactive media space, his comments have appeared in major news and trade media, including the Wall Street Journal, Fortune and Forbes. Previously he was a San Francisco-based freelance writer for business and technology magazines, such as Red Herring, Business 2.0, and Mobile Magazine. Mike began his career in business analysis and journalism as a staff reporter for Forbes magazine, where he covered tech & media.